There is something about a market that draws me like the proverbial bee to the honeypot- no matter where, the mere glimpse of fresh produce on a trestle table and I am totally ensnared. Of course, some markets are more memorable than others. 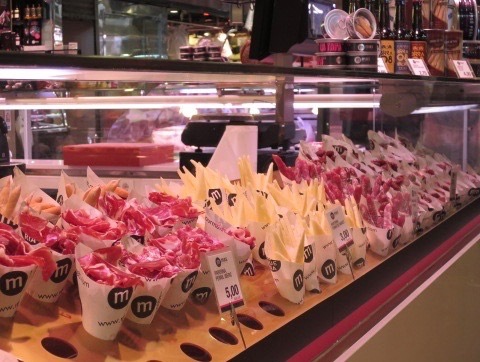 High up on the list is Barcelona’s La Boqueria, with its incredible fish, shellfish and the tapas stands with the paper cones of serrano ham and manchego. Anyone who has used Elizabeth David’s ‘Italian Food’ knows that a visit to Venice’s Mercati di Rialto is an absolute must – her description of soft-shelled crabs has been eternally etched into my subconscious. 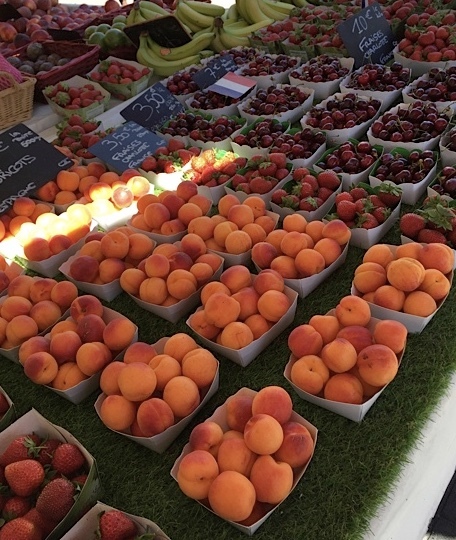 In Nice, half a day from one long weekend was spent at the Cours Saleya; lunch was an impromptu picnic of season-perfect medlars, apricots and cherries on the Promenade des Anglais. In Rome it was the Campo di Fiori, where the baby artichokes proved to be totally irresistible. Doesn’t everyone tour the Colosseum with a bag of vegetables? But part from the ‘celebrity’ markets, even the less well-known ones can be totally intriguing. 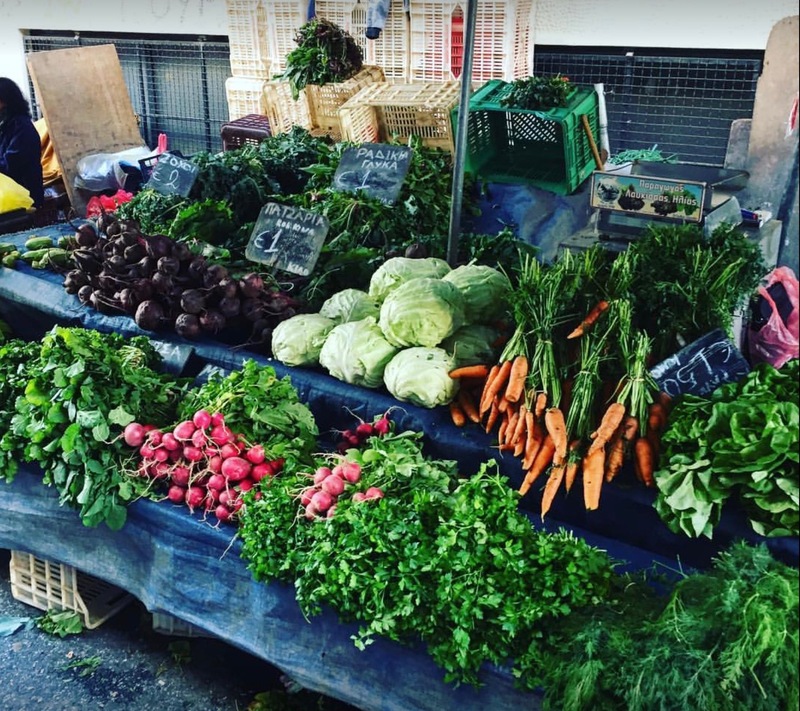 Every Thursday and Saturday, just off the Place de Bastille in Paris, the middle of rue Richard Lenoir is taken up with endless stalls of seasonal produce, gorgeous fish, regional cheeses and more. 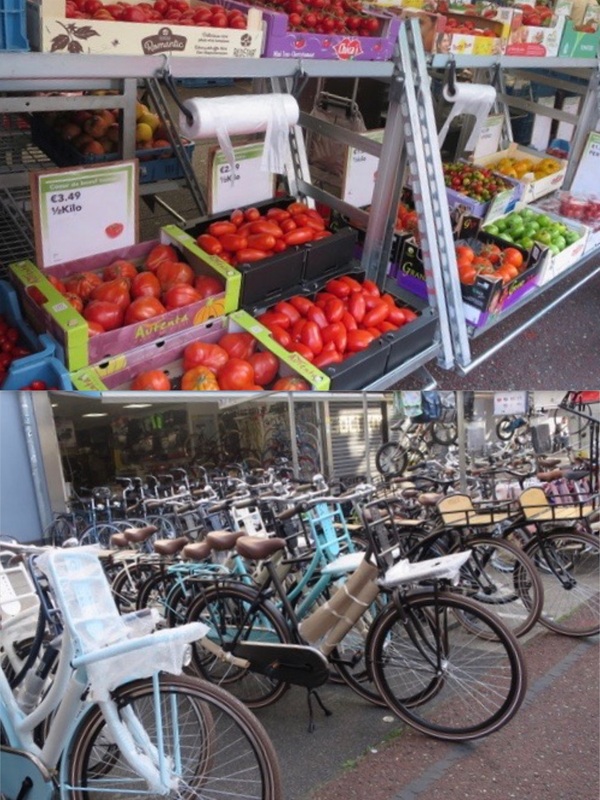 In Amsterdam, the Albert Cuyup street market is the place for more varieties of tomatoes than you ever thought possible and, of course, bicycles – well it is Amsterdam. The masochistic frustration of these visits is that you lust after all the goodies, without the opportunity to cook them (or perhaps even ride them!) 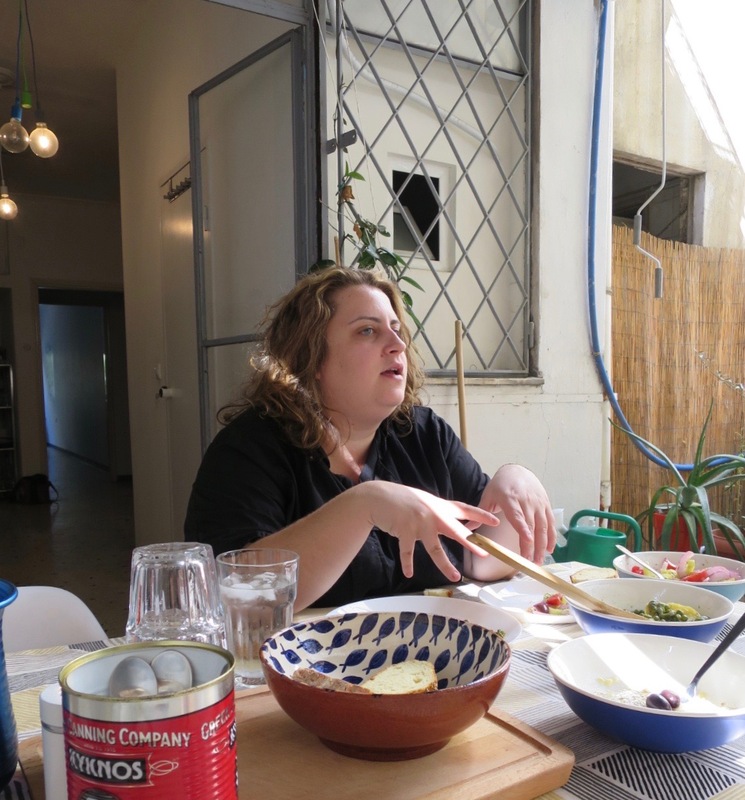 In Athens, a group of enterprising people with a similar passion has created the way to deal perfectly with this form of unrequited love. 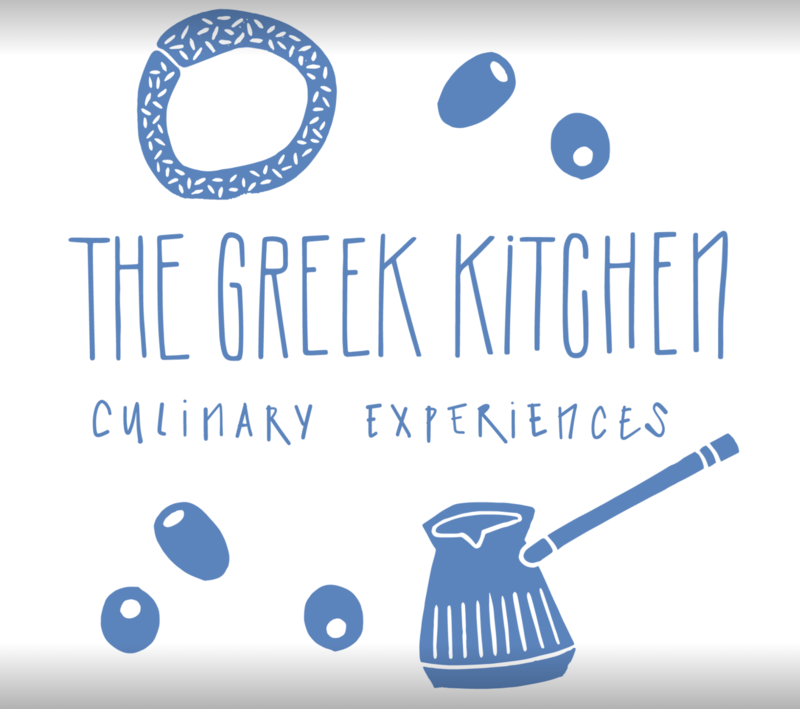 In the first months of 2017 ‘The Greek Kitchen’ opened up on the second floor of a building in central Athens. right next to the historic and endlessly fascinating Varvakeios market. They give visitors to the city guided tours of the market and follow up with hands-on tuition in the classics of Greek cooking. 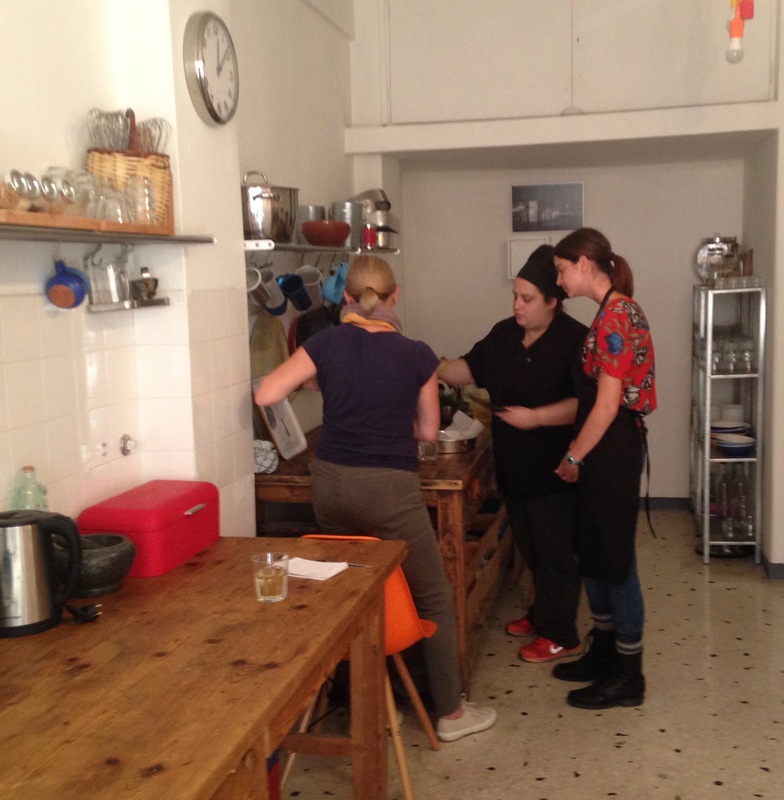 The success of the concept has been confirmed by its TripAdvisor status and is currently the second most popular cooking ‘experience’ in Athens. The surprising thing about ‘The Greek Kitchen’ is that it is the brainchild of two ‘ex-pats’, Stephen Akehurst, from England and Nevyana Kolarova, from Bulgaria. Stephen’s travels have taken him all over the world but Greece has always been his touchstone, with the certainty that his ultimate goal was to settle in Athens. In 2013 he started bringing groups of travellers to Greece and included a visit to an Athenian suburban street market into the mix – the concept of ‘The Greek Kitchen’ was born. 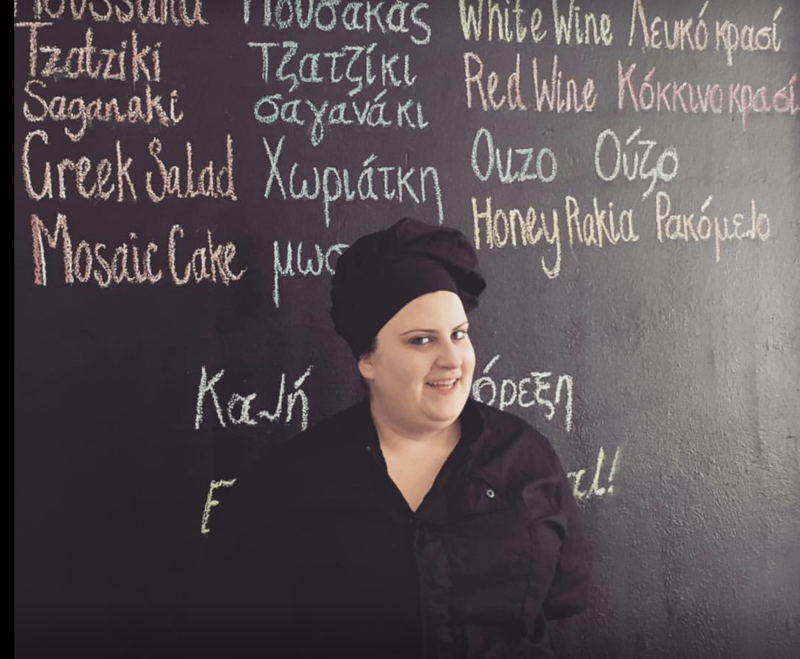 Stephen and Nevyana had the vision and the dream, but they needed a skilled Greek chef to bring it to life – Vásia Sakka is that person. Vásia learned to cook at her mother’s side but with her parents having their own business, Vásia took over the daily cooking from a young age. This was by no means a chore for her; food and shared meals were, and still are, at the centre of family life. Years of professional cooking honed her skills and has forged her into this new role as teacher. Vásia has hit her stride and seems to have found her true calling. The cookery lessons are mainly done as group workshops but individual or smaller classes are available too. Either way the concept is for the participants to have a real ‘hands on’ experience – ‘I’m here to give instructions, not a demonstration.’ Vásia insists. 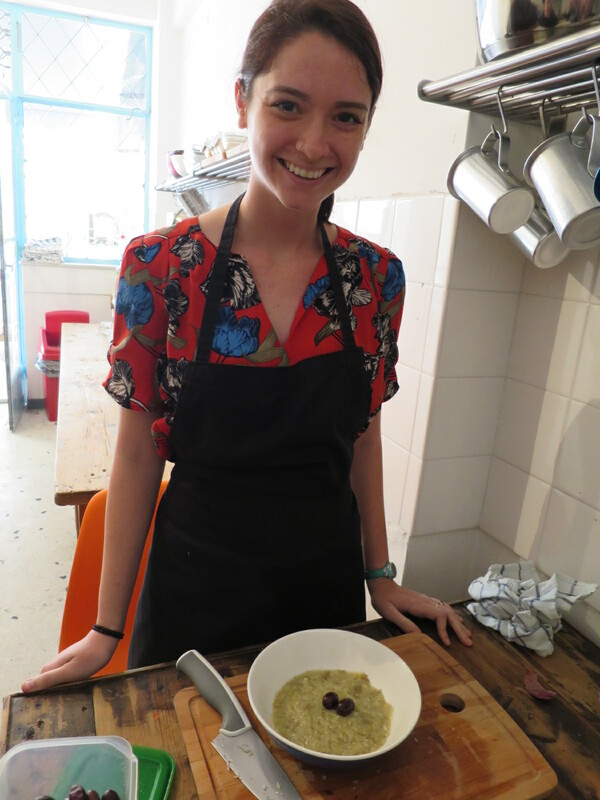 My visit to The Greek Kitchen was on a day when Vásia was doing a one-to-one class; her pupil, a young American traveller, Alex. The lesson for the day included, spanakórizo, melitzanosaláta, braised peas with potatoes with the ‘core module’ being a Greek salad. When I arrived the peas were cooked, the spanakórizo was simmering on the stove and Alex’s garlic chopping technique was being monitored by her eagle-eyed tutor, Vásia . And Vásia is a great teacher, although she freely admits that at first it was all a bit daunting – you get no inkling of this from her easy manner and confident English. 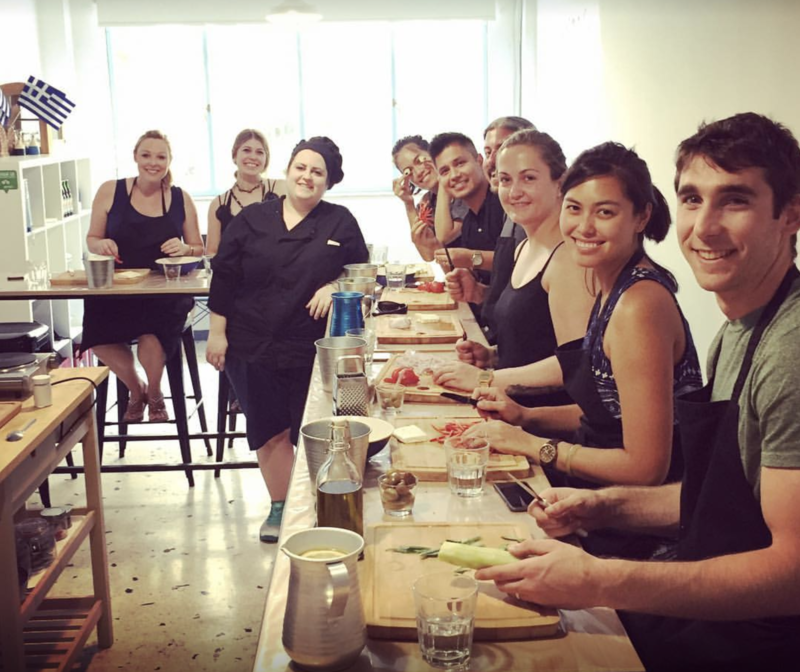 A class at The Greek Kitchen is definitely a fun experience, not a challenge. This ‘private lesson’ had started some 2 hours earlier, with a shopping trip to the market and the perfect opportunity for Alex to learn how to select prime ingredients. 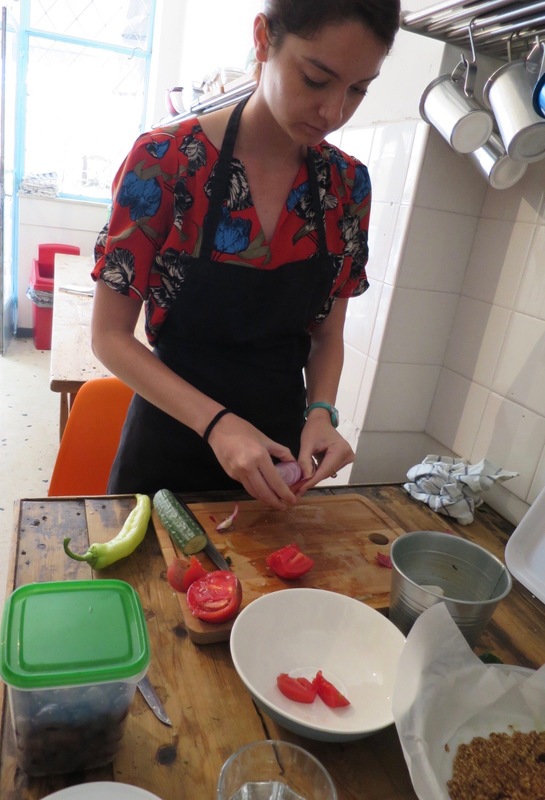 Alex, on a three month trip to Europe from Mississippi, said that she had chosen to do cookery classes in each of the countries she was visiting as a way to get behind the tourist facade and experience a bit of local life. What better way can there be to achieve that than shopping and cooking like a native? 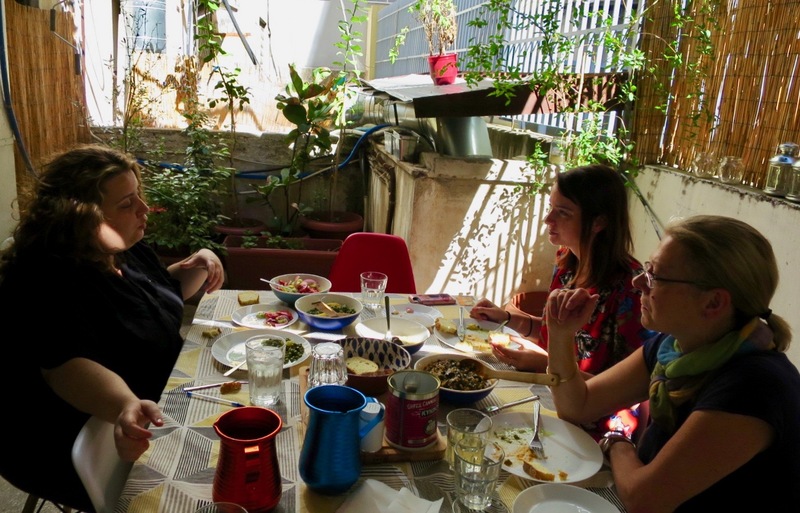 Vásia emphasises this is as one of The Greek Kitchen’s main goals, ‘It’s all about transferring culture through food.’ Following on from the classes, the participants are emailed the day’s recipes, so they can cook them again when they get back home. At the table on the open-air terrace next to the kitchen, we sit and share the dishes that Alex has prepared. Impressively, for a self-confessed non-cook, Alex has made tasty, traditional Greek dishes that are absolutely authentic. Sharing a meal at the end of the class is an integral part of The Greek Kitchen experience, in exactly the same way that it is an important part of Greek life. However busy she is, Vásia says that a four hour Sunday lunch with her own family is still absolutely essential. Around the dinner table is the best place to catch up on news, gossip and crucially, to set the world to rights. The talk turns to Greece, travel, traditions and the future for their cookery school. Despite the challenges of the Greek economy, things are looking very good with bookings all through the winter and well into next year. It is the combination of this kind of imaginative ‘start ups’ and a really vibrant cultural scene that has set the media calling Athens the new Berlin – I throw this observation into the conversation. ‘No!’ Says Vásia, ‘Not Berlin ! It’s the new Montmartre !’ Now there’s a thought !